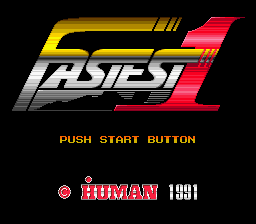 Fastest 1 (ファステスト・ワン) is a 1991 racing game for the Sega Mega Drive by Human. It is seemingly similar to Human's Human Grand Prix series for the SNES. Renovation Products was set to release the game overseas as Speedway Pro Challenge in March 1993, but the release was cancelled for unknown reasons. Box shots have been leaked to the Internet somehow. The game is a generic 3D racing game. accelerates and and change gears. Main article: Fastest 1/Magazine articles.